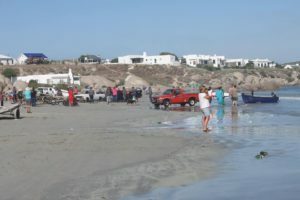 After a long and typically boozy lunch at the Strandloper beach restaurant in Langebaan, you would be forgiven for thinking you had woken up in a quirkily Cape version of Jurassic Park, especially if you decided to take a quick look at the West Coast Fossil Park on Langebaanweg. It’s just so odd and unexpected. If you haven’t been to one of the West Coast beach restaurants (there were three last time I looked), you also need lots of time. The menu is daunting and it is served course by course over the course of some hours. With some necessary dopping in-between (you can bring your own or take your chances with the vin de la cabane): starters are bokkoms (fish biltong, an acquired taste), followed by mussels in wine then mussels in garlic butter; then come the harder, or West Coast chickens, braaied snoek (West Coast beef) with patat, then waterblommetjie bredie, smoked angelfish, stompneus and finally kreef, or, well, West Coast lobster. Elands Bay, the next stop-off place up the West Coast, has become a surfers’ paradise. The Elands Bay Hotel has scrubbed up well in recent times, but unfortunately you cannot easily change brackish water to fresh with a wish. Which is the reason why the early wheat farmers here abandoned Velorenvlei some 200 years ago. It is certainly worth a look-in, especially if you are a first-time explorer to these parts because it reeks of atmosphere and history (the cave on Bobejaanpunt is an archaeological site with, among other attractions, some outstanding rock art). But my suggestion is to keep driving north for another 50-odd km to Lamberts Bay. Attractions here are numerous, not least of all the old fishing harbour where factories now process potato chips, as well as the Cape gannet breeding colony on an island that is now connected to the harbour by a causeway. The vinous gem of the area is Sir Lambert Wines, (Shiraz and Sauvignon Blanc) – about as unexpected to find here as a bear strolling through the Strandveld. The first wine of origin to be certified in that ward. The 2008 white won a gold medal at the Michelangelo International Wine Awards on its first showing and it is a delicious, crisp accompaniment to the seafood fest that awaits you. However, if you only visit the West Coast once, and you stay only one night, make that place Paternoster. It is one of only two places left that exudes the character of an old whitewashed cottage, Cape fishing village (the other is Arniston on the Cape south coast near Cape Agulhas). My favourite place there to stay is Gilcrest Place guesthouse, and I’ll explain why. Firstly, because it’s a really nice place to stay in a really nice place to visit and I would vote it one of the 10 best places to stay in SA if I still wielded a pen around some travel magazine’s office. Second, because it offers food. There are something like 1,000 beds for hire in the small settlement but around 900 of them are in self-catering units. Consequently the 13 restaurants are booked up pretty solid all the time. So you can eat at Gilcrest Place, or not, as your desires take you or as the situation dictates. And then, thirdly, because, as I discovered only this past Easter weekend, it’s owned and run by two old school connections of mine, Terrance and Barbara. Tell them I say hi and will be back soon.